I love a pretty perfume bottle and seems as though I have added quite a few to my perfume collection of late. 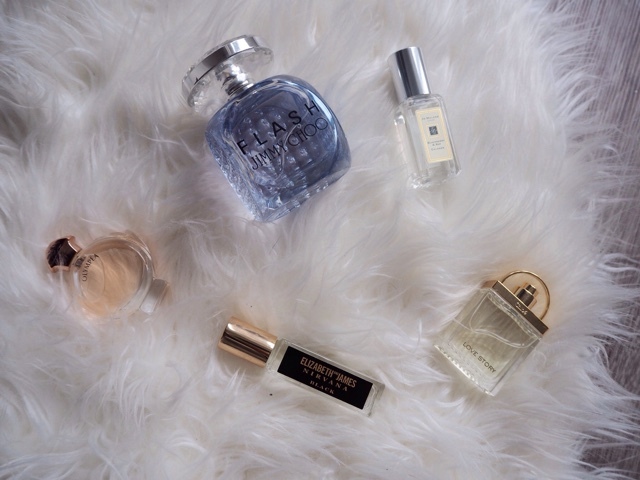 I like to have a selection to pick from as I feel as though my perfume preference can change daily and I like to have ones for everyday use, nights out and special occasions. I haven't bought all of these in one go but I seem to have collected a few new pieces to add to my collection. The first one is Love Story by Chloe that I picked up from the airport a few months ago. I love the shape of this bottle as it is an exact replica of its larger original size. I feel as though this is quite a sophisticated perfume that has the right amount of sweetness in it. It is quite floral but in a very flattering way that isn't too over-baring. Another addition is Olympia by Paco Rabanne which I was given at the #BloggersFestival in September. This is a pretty sweet perfume which I wouldn't usually opt for but I love the signature vanilla undertones. When I was in New York I went to Sephora and because I received over 100 points on their Beauty Card I got a free Elizabeth and James Roll-On Perfume in Nirvana Black. I love the application as I find that with miniatures in particular it can be hard to apply if you have to dab it on. The roll-on ensures that only a controlled amount is applied in a specific area. I think that this is quite a masculine scent which might be due to the sandalwood but due to the vanilla it is slightly sweetened. Before Christmas Boots had a special offer on Jimmy Choo Flash perfume which I had been lusting after for quite a while. It was reduced to less than half price so I bought it as a little Christmas present to myself. I love it so much, it seems to be the perfect mixture between a sweet yet sophisticated perfume. It is quite fruity and has amazing lasting time - plus the bottle is so pretty! My most recent addition to the collection is the Blackberry and Bay Cologne by Jo Malone. This little miniature was in a little Christmas cracker gift set that James so kindly bought me for Christmas. It is a truly beautiful perfume that is a really high quality. It is very fruity with the top note being blackberry and I can see this being a beautiful summer scent. I think I will save this one for when we go on holiday later on in the year. As I am sure you have noticed, none of these perfume bottles are actually full sized. I feel as though I am still on a mission to find my 'signature scent' and so I like to get little bottles as my taste in perfumes can change pretty quickly and I love trying new ones. If I were to do this with full sized bottles however, I feel as though I would spend so much more money and probably waste it if I went off a particular fragrance. 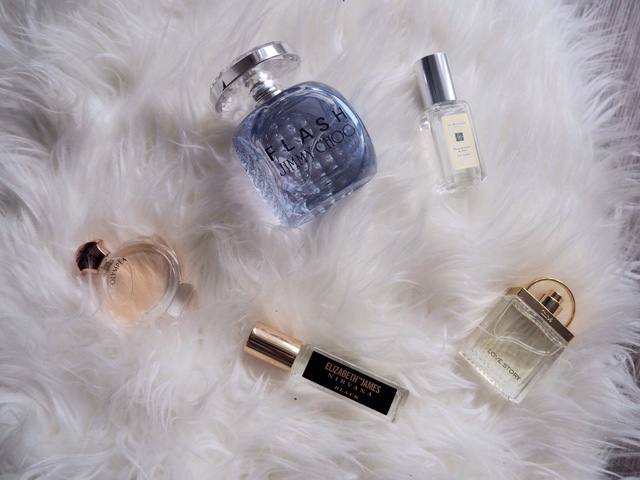 Have you got any new additions in your perfume collection?